It's hard to pin down the precise spirit of Cherry Beach. The most important thing to know is this that people like it here. Head to Cherry Beach on a Saturday afternoon in the summer and you will have a hard time finding a parking space. The bike paths nearby are humming with cyclists. Pedestrians trek down Cherry Street to find the water's edge, it's just one of those places that Toronto is blessed to have. 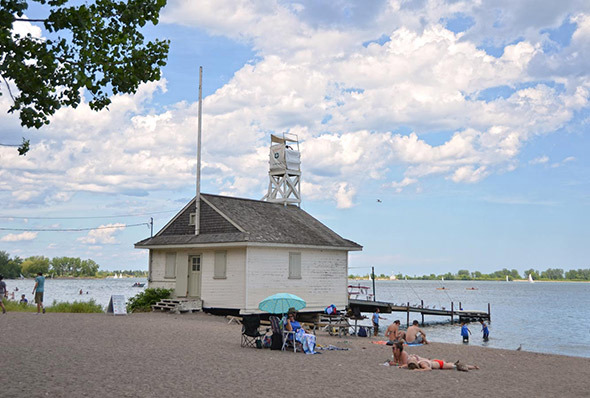 The lifeguard station — similar to the one at Balmy Beach — is picturesque year-round and usually features prominently in photos of the area. IRL the station stands out, but it's not the sole soul of the beach. When you actually stand here, the first thing you notice is the number of dogs trotting around. There is a fenced-in, off-leash zone where dogs can run free on summer days. This attracts dog owners from all over the place (hence why the parking lot is often busy). Dogs are supposed to be kept on their leashes outside of the zone, but on some days there are nearly as many dogs in the water as (human) swimmers. The second thing newcomers will notice is that, despite its name, there is no traditional "park" here. There's limited lawn space at the northern end with some outdoor grills and picnic tables, but no fountains or gardens, orderly paths or park benches. 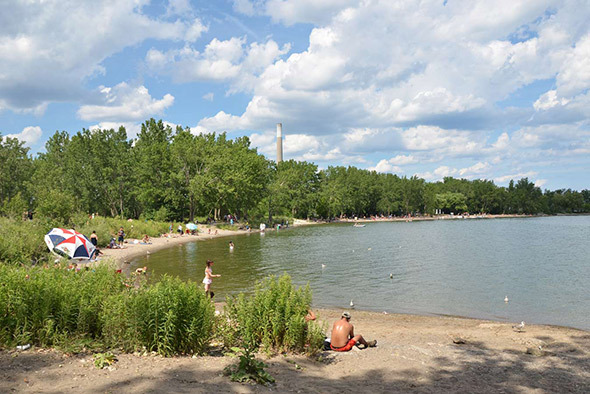 Instead of being a clearly defined, manicured "park", Cherry Beach at Clarke Park offers a little bit of everything. 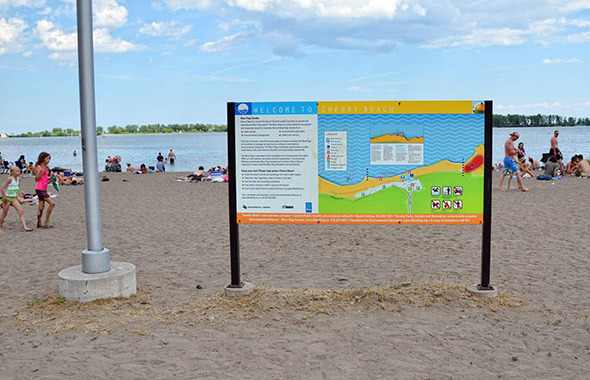 Cherry Beach is a rugged, honest, thin stretch of beachfront property that links the Outer Harbour to Toronto's Portlands: some sand, some large rocks, some concrete and some trees. There are fewer flowers here than other parks, but more butterflies and birds. There's also sand if you want to flop in the sun. 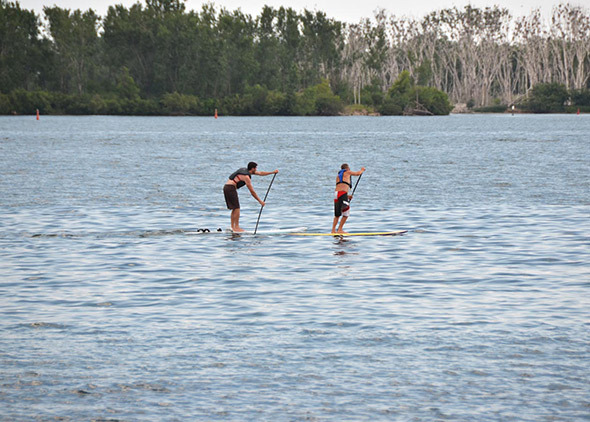 The recreational sports beach is just each of the bathing beach, offering Stand Up Paddling opportunities and windsurfing for people who like to be more active. 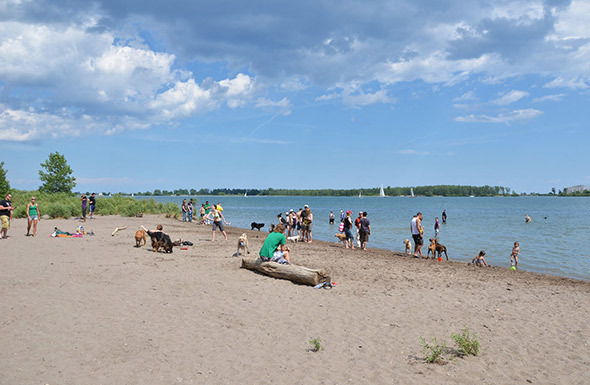 The water quality at Cherry Beach is generally good, but bacteria tests are only part of the picture. Cherry Beach is rocky and most people wear swim shoes here. Those rocks also nurtures algae. There are days when the water is technically "safe", but you may be turned off by algae along the shoreline and on the rocks underwater. 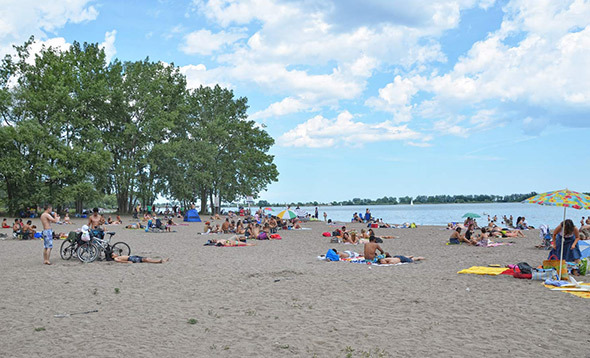 Sunday afternoons are prime time at Cherry Beach, with lots of visitors and activities in the summer. Facilities: Washrooms, nearby sports fields, and occasionally an old-style food truck. Transit: Car parking is available at the beach in two lots. 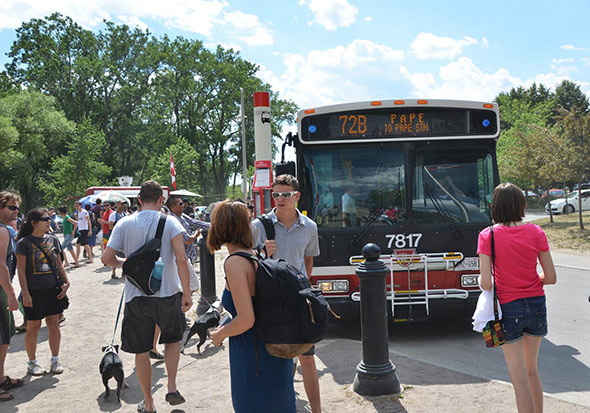 By TTC, the 72B from Pape will take you to the beach between May and Labour Day. Aggressiveness of seagulls and geese (out of 3): 1.5 (picnicking people in the park to the north do attract some bird play). Krystyn Tully is the co-founder of Lake Ontario Waterkeeper, a Toronto-based charity working for a Lake Ontario in which you can swim, drink, and fish. Check out her Swim Guide smartphone app for more info about beaches in Toronto and beyond.